A long long time ago, I posted this photo of the Galliera Palace (after Duchess of Galliera), a stunning building that was built between 1878 and 1894 and that now shelters the fashion museum of Paris. In 2009 it closed for renovation and it just reopened about a month ago. 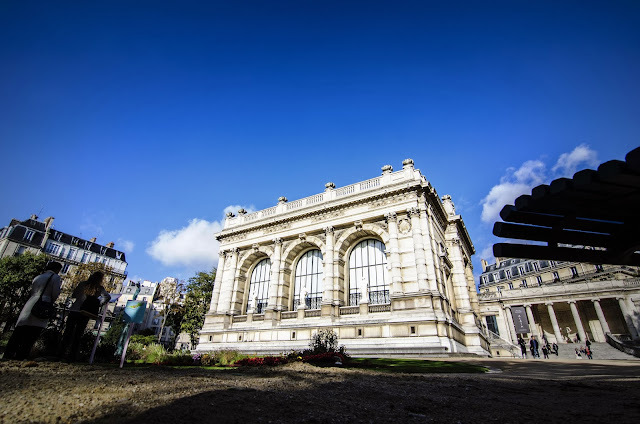 It's an absolute must see if you come to Paris, not only for what you can see inside (at the moment there is an exhibition dedicated to designer Azzedine Alaïa), but also because you can enjoy a nice walk and rest in the garden around it. Yes, we are lucky at the moment! Gorgeous photo. I love it. It looks very beautiful. Not far I guess from the photo you posted yesterday? I don't look it, but I love to read about and look at clothing, especially high-fashion designs. I will definitely visit this beautifully photographed museum. I will be in Paris in December and the Palais Galliera is on my "to-do-list". I love the fasion exhibitions in Paris! Merci for the timely tip—I've put it on my list! All these lists - it's now on mine too! We must all compare lists sometime. I'll show you mine if you show me yours!